Well, there was this German Shepherd that live under my father's work trailor. My dad's friend, Tim, was heading home. He had no idea a dog was watching him. When Tim left, the dog ran after his car. Tim looked in his mirror and saw a black figure running behind his car. Tim got home and got the dog on a leash. 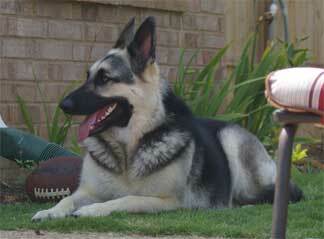 Tim washed the dog, and found out that it was a German Shepherd. Tim got my dad to bring the family over and found a tattoo in his ear. He is one very expensive dog! We decided to adopt the dog from from Tim and found the dog that is now named of King, had three types of worms! He is all cured and is living a perfect home with another german shepherd. It is name lucki. He also lives with a cat named sir purr that beats him up. The cat doesnt have any claws, so king wouldnt be a goner! Thanks so much to your friend Tim, your dad and everyone else involved in getting this stay German Shepherd a new home. I know he will be forever in your debt and I hope he makes you a great companion. What a Lucky boy King is and handsome too! What a perfect name for him, he is big and strong. You two are meant to be. You see how amazing German Shepherds are and how Protective they are. Take care of your boy and he will take care of you!